“Cooking is like love. It should be entered into with abandon or not at all.” This vintage quote by the late columnist/film critic Harriet Van Horne is the perfect introduction to this week’s interview with Tony Wilkins, author of The Single Person’s Cookbook – Lessons in Life, Love and Food. When he’s not stirring up fun, dolloping heaps of wisdom, and serving timely tips to fans of his weekly San Francisco talk show, this multi-talented entrepreneur can likely be found conjuring culinary magic – and courting romance! – in his home kitchen. 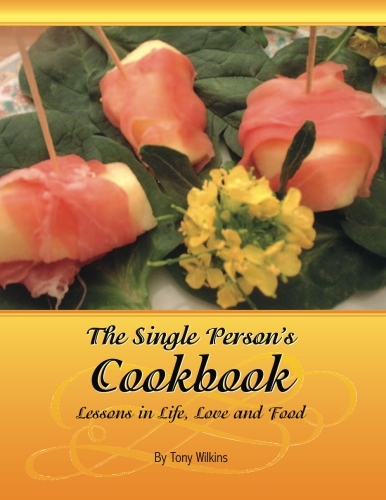 Whether you’re young and just starting out, older and unexpectedly starting over, or simply savoring the simplicity of singlehood, Tony’s book is a tasty blend of approachable menus and saucy anecdotes. Q: Are you a self-taught cook or did you spend a lot of time in your mom’s kitchen growing up? A: I’m self-taught. However, I grew up watching Julia Child a lot as a kid. Q: What was your favorite comfort food as a child? Is it something that still fills you with bliss as an adult? A: My favorite meal as a kid was fried chicken with buttered corn and mashed potatoes. And to this day if I have a rough day it’s my “go-to meal”. With a glass of wine, of course. Q: Are there any foods you run away from? A: Yes. Cooked rutabagas. I can’t stand the smell. Q: What’s your favorite spice or herb? A: Herbs de Provence. It classes up everything from veggies to meat. Q: So tell us what inspired you to write a cookbook. A: I was inspired to write the book because writing my (first) book on telemarketing was more labor intensive. The cookbook was my way of telling my story thru my love of food. The rationale was that because it wasn’t about marketing or business, it would be a fun project. It turns out that it was a lot more difficult to write than the first book because I don’t measure anything unless I’m baking. Q: Most cookbook recipes are written to accommodate 4-6 hungry people. What were the challenges in creating tasty meals for a person who lives – and goes grocery shopping – alone? A: That’s the strange part because I grew up watching my mom cook for the entire family (4 people) so I had to teach myself how to cook for 1-2 ;which took years to get right. Grocery shopping was easier because I tend to buy in bulk anyway although it can be difficult to see a sale on a 20 pound bag of chicken wings and not throw it in my cart. I think the real lesson to remember when cooking for two is this: buy in bulk but break things down into smaller packages whenever possible for faster, easier cooking. So, for example, meat can be purchased in bulk but cut into smaller pieces for easy freezing and cooking. The same with veggies, stocks (for soups) and sauces. Q: Speaking of grocery shopping, are you someone who makes it a snappy and efficient expedition or a leisurely one? A: Leisurely. I rather like the experience of finding new items to buy. Q: What’s your favorite aisle? A: I love the meat section. I don’t know why. I just do. Q: It has long been said that the quickest way to a man’s heart is through his stomach. Tell us about how this applies to your three-date rule. A: LOL. My friends would tease me all the time about cooking for my dates because they felt that it was a sure fire way to run off a man. It’s funny women love having others cook for them but many men feel trapped in a relationship if someone (male or female) cooks (for them) by the third date. Other than that, at my age I don’t really believe in the 3 date rule. Whatever makes you feel comfortable is what you should do. And no, I don’t listen to my friends’ advice anymore about cooking for someone I like. Q: Do you have a signature “date night” dish when you want to impress someone new? A: Yes. Chicken Linquica is a favorite or a roasted chicken always goes over well. Both are very simple one pot/pan dishes I can make without much thought or prep. Q: Do you ever invite your guest(s) to help or do you prefer to run the whole show yourself? A: I hate others in the kitchen with me. I often tell my guests to choose a movie while I’m in the kitchen but truthfully by the time they arrive dinner is usually already done. Q: Have you ever had a kitchen disaster? A: God yes. I think every cook has had a disaster at one point or another. It’s how we learn. It was when I was very young and really wanted to impress someone by cooking a dish in a pressure cooker for the first time. Needless to say I haven’t used one since. Q: Do you set a formal table when it’s just you or do you carry your plate to another room? A: I eat in the living room because I want to watch TV or work while eating. I know it’s bad but one should be comfortable when eating. There’s something a bit pathetic about (me) sitting alone at my large wooden kitchen table and eating a meal. For some reason it feels as if the neighbors are watching me with pity in their eyes. Q: The book is filled with anecdotes about your love life. For you, which food is the most potent aphrodisiac? A: Again, a really wonderfully roasted chicken is comforting and comfortable and puts everyone in a relaxed amiable mood for whatever comes next. Q: With the holidays just around the corner, what do you do to keep yourself from stressing out as a party host? A: Besides going to someone else’s house? I keep it simple and have cooking time down to 2 hours. I taught this trick to my girls, Leslie and Robyn, and now every year they call me with a report on how their cooking experiences. Here’s the secret. First handle as much of the prep work a few weeks in advance because it’s not the cooking that takes so much time; it’s the prep work. So any chopping of veggies can done weeks ahead of time and stored in the freezer until you need them. Next, if you’re cooking for 1-2 people buy turkey parts – legs, thighs, etc. separately instead of a whole turkey. This way you’ll cut down on prep as well as cooking time. Also I try to have all of my spices (for the day) seasonings, etc. all in one place or grouped together so I’m not spending 10 minutes searching for nutmeg. Lastly, keep things simple and on your terms because it’s supposed to be a time to relax and enjoy family and friends. So make sure that whatever you decide to do this holiday season, you do it on your terms. Q: What are the 10 most important staples in your pantry? A: I’ll give you a few extras. Salt, pepper, butter, olive oil, chicken, pasta, sausage, bacon, Herbs de Provence, tomatoes, corn, onions and shrimp. If I have these in my kitchen, then I can cook just about anything. Q: What’s your most treasured kitchen appliance or accessory and how long have you had it? A: I’d say my 3 cast iron skillets, all of which I’ve had for over 20 years. Q: You live in San Francisco, one of the most foodie-centric cities in the country. On the nights when you’re not cooking, what are some of your favorite haunts? Q: Who do you think make better chefs – men or women? A: Now that’s a great question. I think men and women approach food differently. Men tend to have a technical approach to cooking which in theory would make them better chefs (I suppose). But women tend to be more creative and approach food from an emotional standpoint which would make them better cooks (again in theory). Having said that, both are equally important to the food industry. Nigella Lawson, for example refers to herself as a “cook” but she’s got more passion for food than just about anyone on TV today. On the other hand, Julia (Child) was a chef and was equally passionate about cooking but she focused more on the technique of cooking. Keep in mind that Julia also trained at Le Cordon Bleu and was the only female in her class. Q: If you could invite your favorite celebrity to dinner, who would it be, what would you serve, and how would the table be set? A: Oh that’s easy although I would invite several people including singer Julia Fordham, her sister Claire, and Nigella Lawson. Ironically, a singer, a writer and a cook who all happen to be British. The dinner would be a simple roasted chicken with veggies or my new favorite comfort dish – fried catfish over Campbell’s Chunky chicken gumbo. The dish sounds (It’s a Creole dish I came up with one night) very odd but trust me, not only is it delicious but it’s done in about 15 min. The table would be simple, elegant but welcoming with a bit of candlelight and Julia Fordham playing in the background. Q: What are you having for dinner tonight?